Witches and monsters and vampires -- oh my! 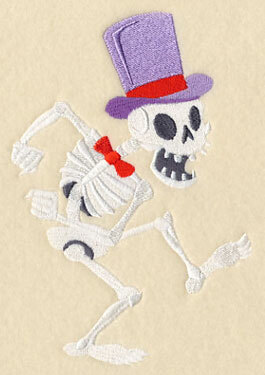 Get ready for the spookiest holiday of the year with new embroidery designs! 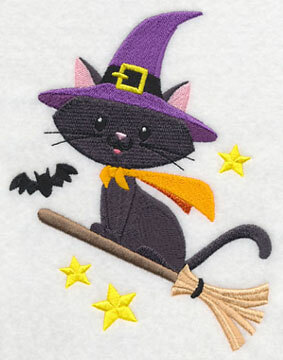 Bewitch your friends and family with frighteningly charming Halloween garments and decor. 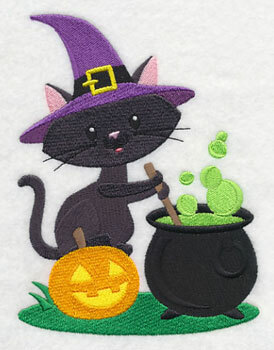 Sweeten costumes and trick-or-treat bags with de-frightful black cat designs and dancing Monster Mash characters. 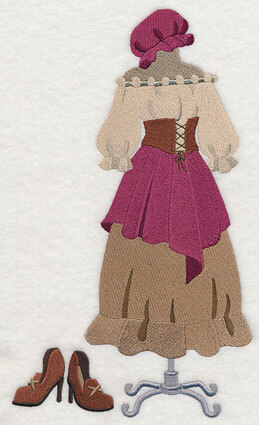 Fashion plate medleys and dress forms add a sophisticated look to shirts and bags. New haunting silhouettes set a bone-chilling scene. 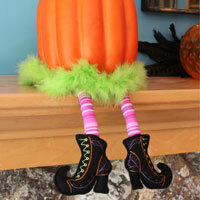 In-the-hoop witch boots are a spooktacular addition to Halloween home decor. 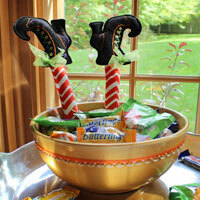 We used them in a candy bowl (shown left) and they're getting rave reviews. Scroll down to see these boo-tiful new designs! Get them while their haunt! Eeek! 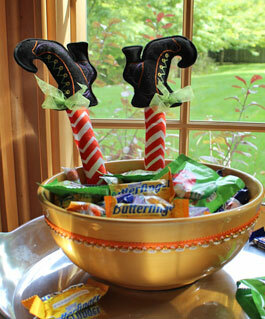 A pair of in-the-hoop witch's boots are the perfect way to add a little fun and flair to your Halloween candy bowl. Nail your outfit on October 31 with these dress forms featuring popular Halloween costumes. A wicked witch ensemble (complete with pointed hat and broom!) 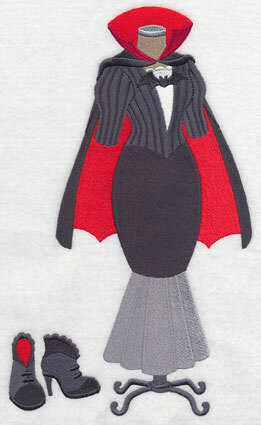 is a fabulous addition to tote bags; add a vampire dress form to wall hangings and pillows. 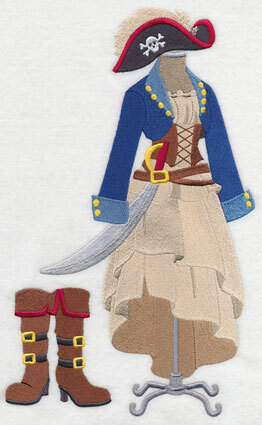 6.91" x 10.14" and 5.90" x 8.66"
6.46" x 10.64" and 5.42" x 8.93"
4.50" x 7.41" and 3.95" x 6.51"
Costumes for a pirate and a beer maid are fabulous embroidery additions to a variety of projects. A pirate's hat and sword with scabbard give this pirate extra swashbuckling flair; a traditional corset and hat are true to historical beer maid attire. 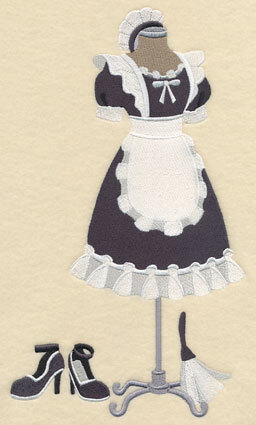 Dress up as a French maid or princess this Halloween! 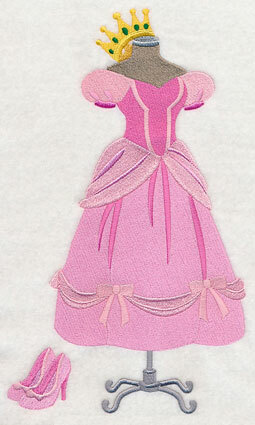 The sweet, feminine outfits make fabulous embroidery additions to wall hangings, trick-or-treat bags, or pillows. 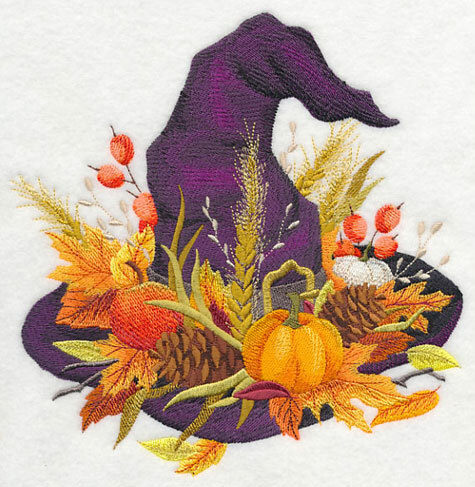 4.49" x 7.55" and 3.95" x 6.63"
This design features a witch hat in stunning autumn foliage. Pumpkins, pinecones, and other fall elements add a gorgeous autumn feel to pillow covers and wall hangings. 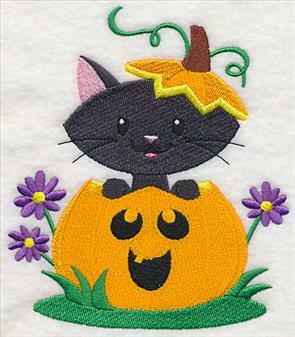 7.62" x 7.79" and 6.89" x 7.03" and 5.85" x 5.99" and 4.85" x 4.97"
A playful black kitty peeks from inside a Jack-o-lantern surrounded by autumn gourds and fall foliage in this too-sweet Halloween design. Stitch the boo-tiful cat on pillows, wall hangings, tote bags, and more. 7.55" x 6.87" and 6.42" x 5.84" and 5.33" x 4.84"
Black cats celebrate the season with tons of 'tude in these too-cute designs. 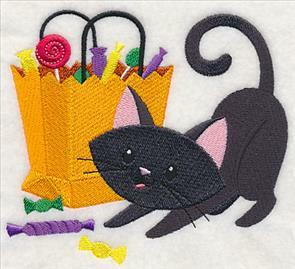 The sweet yet spooky collection of Halloween cats is a great way to make a quilt, series of trick-or-treat bags, or wall hangings. 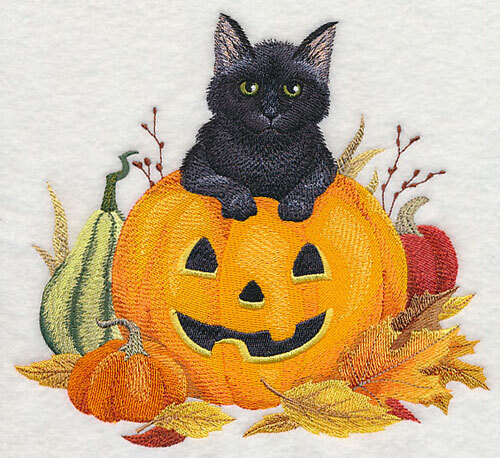 4.82" x 6.40" and 2.92" x 3.88"
Forget the idea that black cats are bad luck -- these adorable kitties are too cute to spook. 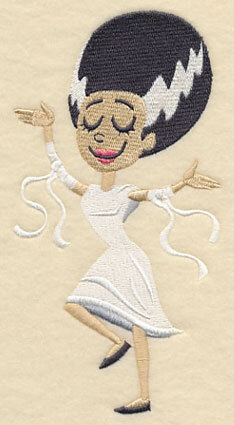 Stitch your favorite on its own, or use them both in one project for double the trouble! 4.85" x 6.29" and 2.99" x 3.88"
Trick or treat...take your pick! An impish black cat explores the streets at night ready to cause some mischief, while an excited kitty digs into its bag of treats. 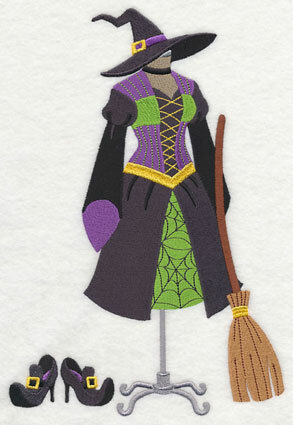 Stitch these Halloween designs on kids gear, towels, or trick-or-treat bags. 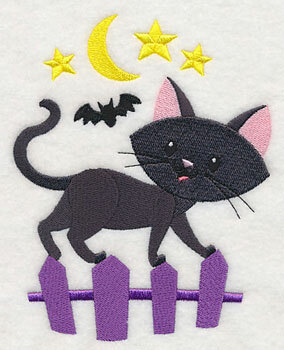 5.34" x 4.83" and 3.58" x 3.24"
These cute kitties are a fabulous addition to any Halloween embroidery project! Get the whole litter of designs in a design pack. Meow! 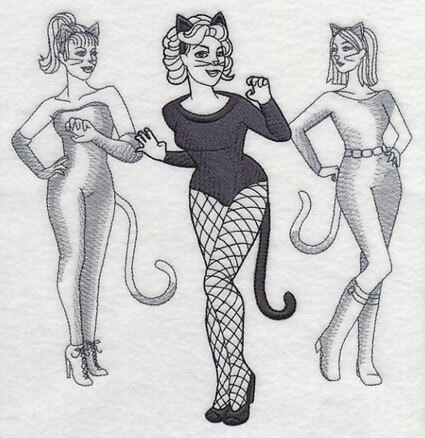 This costume fashion plate features three black cats ready to prowl on Halloween night. Add it to low-nap towels, sweatshirts, and other seasonal decor projects. 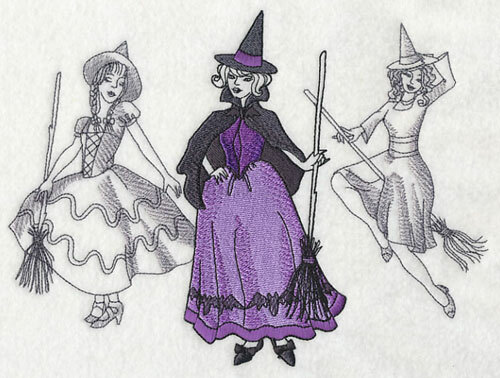 7.63" x 7.80" and 6.90" x 7.06" and 5.85" x 5.99" and 4.85" x 4.97"
Cast a spell this Halloween with a perfectly wicked fashion plate design. 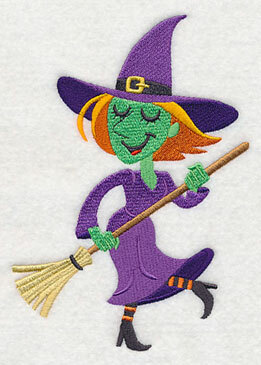 Three witches are ready to ride away on their broomsticks -- stitch it on tote bags, pillows, and more. 9.27" x 6.90" and 7.80" x 5.81" and 6.51" x 4.85"
A trio of magical sprites with intricate wings are ready to step out on Halloween. 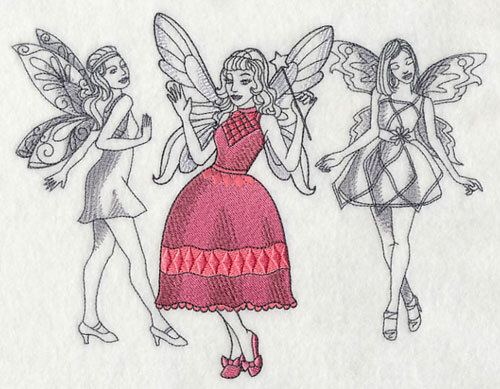 The light, sketch-style ladies in the background nicely complement the bright, colorful fairy in front. 9.01" x 6.90" and 7.64" x 5.85" and 6.30" x 4.82"
Classic Halloween characters get their groove on to the Monster Mash in these de-frightful designs. 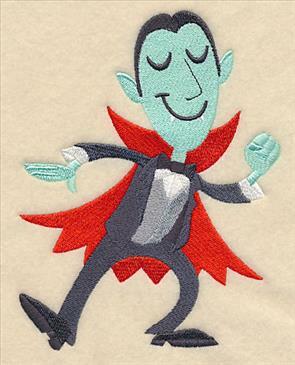 Add a dancing Dracula or a witch to your next Halloween embroidery project. 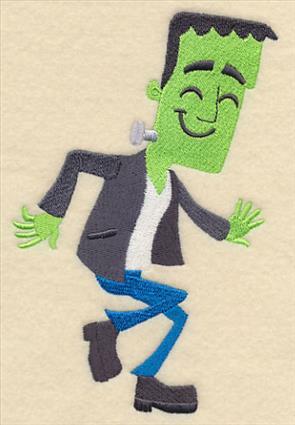 4.84" x 6.77" and 2.76" x 3.86"
Frankenstein's monster and the bride of Frankenstein dance the night away in these fun Halloween designs. Stitch the spooky couple on trick-or-treat bags, kids apparel, and more. 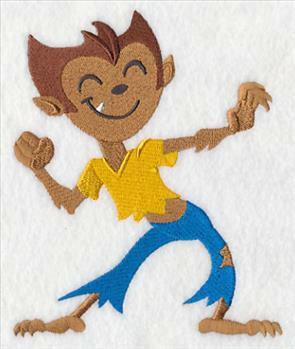 3.61" x 6.86" and 2.04" x 3.87"
A skeleton and a werewolf boogie down to the classic Halloween song in these embroidery designs. 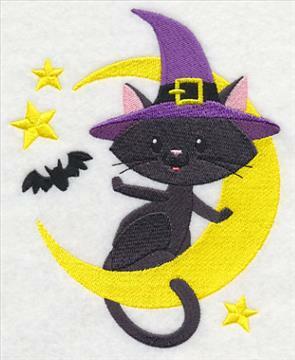 Terrific on Halloween decor, quilts, and more. 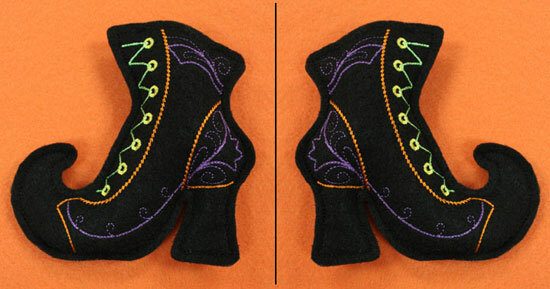 4.84" x 5.96" and 3.14" x 3.87"
Traditional spooky characters cut a rug in these Halloween designs. Skip the trip to the haunted house this Halloween and stitch one instead! 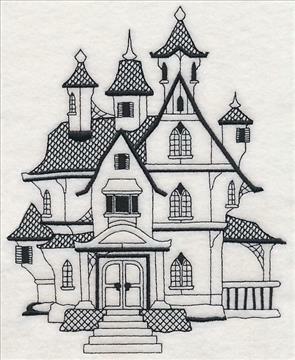 This blackwork haunted house features all the fun and flair (and cobwebs!) 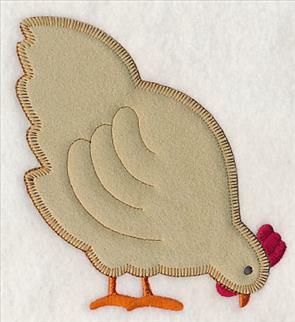 from the real thing -- stitch it on pillows, wall hangings, tote bags, and more. 6.85" x 8.47" and 6.31" x 7.80" and 5.86" x 7.24" and 4.86" x 6.00"
Get into the Halloween spirit with these chilling silhouettes. Each of the panels depicts an outline of a spooky scene. Here a haunted house sits in front of a cemetery; a witch flies out into the midnight gloom. 5.38" x 11.75" and 4.31" x 9.41"
5.38" x 11.75" and 4.31" x 9.40"
3.59" x 7.83" and 3.14" x 6.85"
A glowing silhouette luminary is a terrific way to spread Halloween spirit this October. 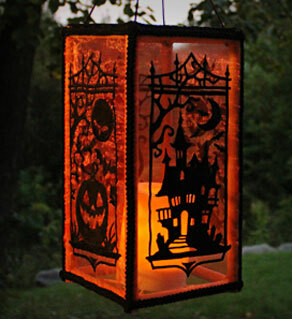 Light the way for midnight mischief -- the spooky scenes stitched on organza gives a soft, glowing appeal to the lantern. See how these shadowy panels transform into a fabulous Halloween luminary (and learn how to make one yourself!). A carved Jack-o-lantern flashes a chilling grin; a black cat and raven await the witching hour. Stitch these scary scenes as a series of wall hangings, on wall dividers, or as framed panels. 5.38" x 11.75" and 4.30" x 9.40"
3.59" x 7.83" and 3.14" x 6.86"
A pair of delightfully wicked witch's boots are a fabulous addition to your haunting Halloween decor. Feature them peeking out of a candy bowl, hanging out on a mantelpiece, or sticking out from under a door (plus they're fabulous hanging out of a drawer or from a wreath!). 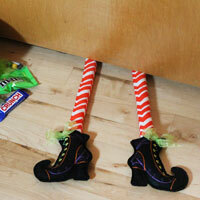 Learn how to make the witch boots right in the hoop by following our step-by-step instructions. They're a glamorous addition to your Halloween decor! 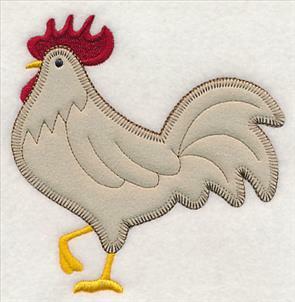 Margherita requested we add heirloom applique versions of chicken and rooster designs to the site, and we loved the idea! 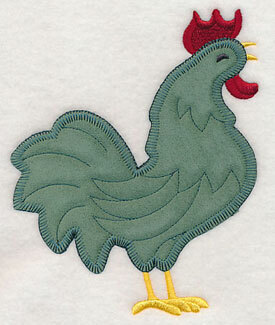 Here three different chicken and roosters are ready to be stitched on your next embroidery project. Thanks, Margherita! 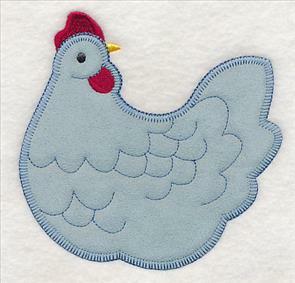 4.84" x 5.53" and 3.37" x 3.85"
Heirloom applique features a blanket stitch, or E-stitch, around the outer edges of the applique designs. 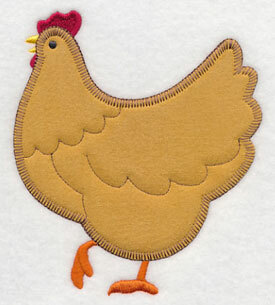 Learn how to stitch heirloom applique designs by following our project instructions here, or by watching our YouTube video here. 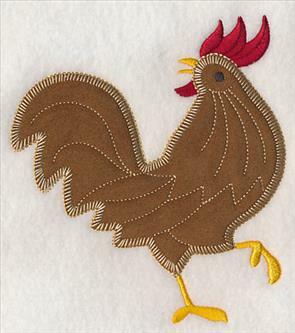 4.85" x 5.47" and 3.43" x 3.87"
These heirloom applique chicken and rooster designs are a fabulous addition to kitchen projects, pillows, apparel, quilts, and more! 4.85" x 4.97" and 3.77" x 3.86"